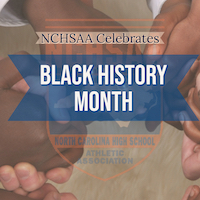 During the month of February, in honor of Black History Month, the NCHSAA website will feature information about African-Americans who have made major contributions to the great tradition of high school sports in our state. We hope you find these both entertaining and informative. Our thanks to Rick Strunk, former NCHSAA Associate Commissioner, on his research into many of these articles and Championships. The North Carolina High School Athletic Conference (NCHSAC) served for many years as the athletic organization for historically black high schools during many of the days of segregation. The NCHSAC conducted classified championships in several sports, certified officials and administered its athletic program. Dr. Army Armstrong of Rocky Mount, now a member of the North Carolina High School Athletic Association Hall of Fame, served as its commissioner for many years. Many members of the old NCHSAC, which numbered well over 100 schools at one point, joined the NCHSAA when the Conference merged with the Association. The NCHSAC actually disbanded in 1969 after its start in the late 1920's. We have done quite a bit of research into the history of the organization and even list results of its championship games, as available, in current NCHSAA championship game programs as part of the historical record. Some of the information we've been able to gather you can find at the links below. The list of schools which competed for championships in the NCHSAC would include some familiar names and maybe some less so: Greensboro Dudley, Fayetteville E.E. Smith, Asheville Stephens-Lee, Lexington Dunbar, Chapel Hill Lincoln, Rocky Mount Booker T. Washington, Durham Merrick Moore, Williamston E.J. Hayes, Winston-Salem Atkins, Gastonia Highland and Hickory Ridgeview, just to name a very few. We want to recognize the contribution of the NCHSAC and its member schools to the great high school sports tradition in our state.